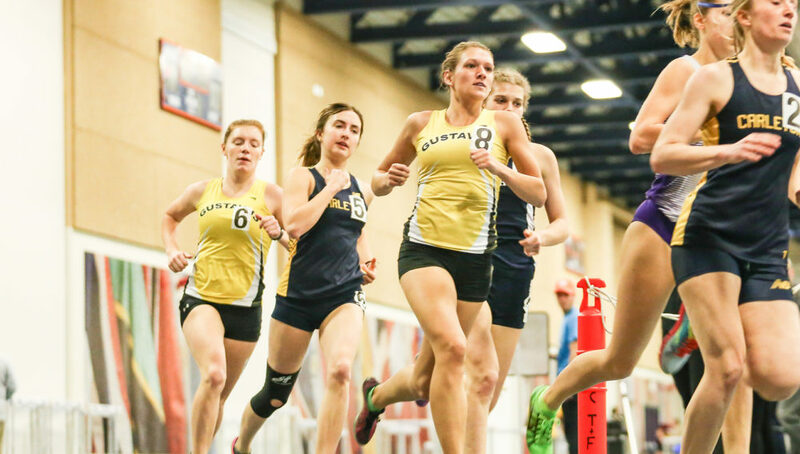 ST. PAUL, Minn. – The Gustavus women’s track & field team wrapped up competition at the 2018 MIAC Indoor Championships Saturday at Macalester College, turning in 64 team points for a seventh place finish of 12 teams. Scoring 49 points to sit in fourth place after day one on Friday, the Gusties tacked on another 15 points on Saturday, dropping to seventh. The team of Lydia Hayes (Sr., Decorah, Iowa), Megan Hill (So., Denver, Colo.), Abbie Schnabel (Jr., Hamburg, Minn.), and Tierney Winter (So., Waterville, Minn.), who finished first in the distance medley relay yesterday, continued to perform on Saturday, scoring in the 4×400-meter relay. They finished at 10:22.96 to claim sixth place. Schnabel, Hayes, and Winter then finished in sixth through eighth place, respectively, in the 1,000-meter run to combine for six team points, finishing at 3:04.65, 3:04.79, and 3:05.10. Sadie Klug (Sr., Waseca, Minn.) and DeAnna Giles (Fy., Plymouth, Minn.) also combined for seven points. Klug finished sixth in the 3000-meter run with a time of 10:22.96, while Giles went 34-7 in the triple jump to finish fifth. The 2018 outdoor season begins March 29, as the Gusties head to Saint John’s University.